The Paw Justice Charity Shop, I cannot rate these guys highly enough, stop doing what ever it was that you were doing before and start using this service now! I placed an order that was delivered to my door within a day of ordering online, including complimentary treats for both me and my dogs, and a hand written post-it from one of the co-founders thanking me for my support. What's more, the food that I purchased did not cost a penny more than what it does in the shops. There is free shipping for orders over $50 dollars, and they have a good product range. Funding the work of any charity is always difficult, none more so than during a recession, but these guys have their finger on the pulse of every aspect of the foundation they established nearly 5 years ago, and we could learn a lot from such a smart fund raising model. If you cannot afford to donate, then this is an easy way of doing your bit by way of using an online shopping service for your pets basic food and vet requirements. Put simply, shopping here saves lives, and we dig it! The online charity shop offers everything you need in the way of food, basic vet supplies, and accessories for your pets. You click, you pay, and they deliver. 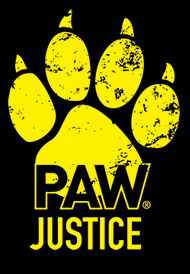 The whole exchange is sweetened with the knowledge the money you are spending is contributing toward the Paw Justice team and the major work they do out in the community to reduce animal cruelty and abuse. Click the link below, it will lead you to the Paw Justice Charity Shop and you can try it for yourself.